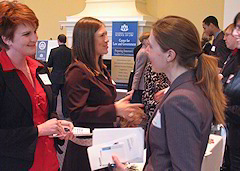 The Washburn Law Government Legal Careers Forum brings together legal professionals working in a variety of government positions to visit with each other and Washburn Law students about the advantages and challenges of pursuing a career in the government. Both practicing attorneys and professionals who use their legal education in a non-practice setting are encouraged to participate in this event. The Forum will facilitate easy networking and conversation, and refreshments will be served. We hope to have a wide variety of representatives on hand to network with each other and with students interested in government careers. This will be an interesting and enjoyable event for everyone involved. Government representatives attending the Forum also are invited to attend a complimentary hour of continuing legal education immediately prior to the Forum. Participating in both the Forum and the CLE is free of charge to employees of government agencies and Washburn Law students. Government agency representatives interested in participating in the Forum: please register online. Washburn Law students interested in attending the event, please sign up in Symplicity (under "Events" tab). Contact Tammy King, Director of Professional Development and Pro Bono, at (785) 670-1703 or tammy.king1@washburn.edu with questions. Please register by Wednesday, February 13, 2019. Pre-register by Wednesday, February 13, 2019. Government agency representatives: register online. Washburn Law students: register in Symplicity (under "Events" tab). » CLE Registration: 2:30 p.m.
» Ethics CLE: 3:00-3:50 p.m.
» Careers Forum: 4:00-5:30 p.m. Parking is available north and south of the School of Law. See also Directions to the School of Law (includes parking). Washburn University School of Law Professional Development Office and Center for Law and Government. If you require any special services or auxiliary aids to assist you while attending this event, please contact Tammy King at tammy.king1@washburn.edu or (785) 670-1703.